You can allow users in your organization to access their LinkedIn connections within some Microsoft apps. No data is shared until users consent to connect their accounts. You can integrate your organization in the Azure Active Directory (Azure AD) admin center. The LinkedIn account connections setting is currently being rolled out to Azure AD organizations. When it is rolled out to your organization, it is enabled by default. The setting is not available for customers using Microsoft Cloud for US Government, Microsoft Cloud Germany, or Azure and Office 365 operated by 21Vianet in China. The setting is off by default for tenants provisioned in Germany. Note that the setting is not available for customers using Microsoft Cloud Germany. The setting is off by default for tenants provisioned in France. Once LinkedIn account connections are enabled for your organization, the account connections work after users consent to apps accessing company data on their behalf. For information about the user consent setting, see How to remove a user’s access to an application. You can enable LinkedIn account connections for only the users you want to have access, from your entire organization to only selected users in your organization. Sign in to the Azure AD admin center with an account that's a global admin for the Azure AD organization. On the Users blade, select User settings. 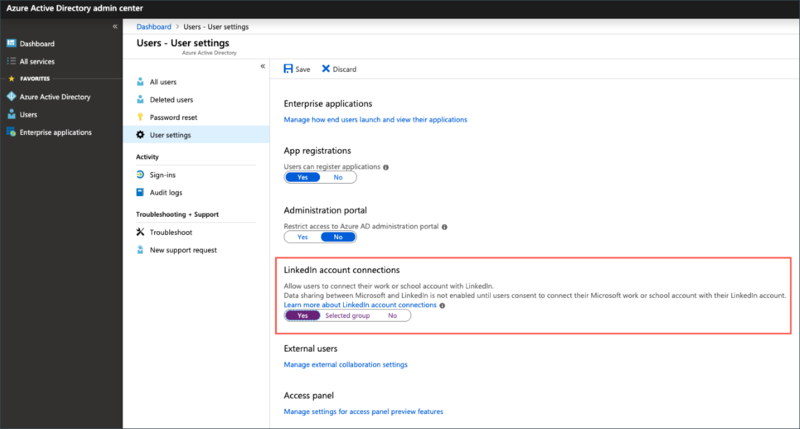 Under LinkedIn account connections, allow users to connect their accounts to access their LinkedIn connections within some Microsoft apps. No data is shared until users consent to connect their accounts. When you're done, select Save to save your settings. Extract the ADMX files and copy them to your central store. Create a Group Policy Object with the following setting: User Configuration > Administrative Templates > Microsoft Office 2016 > Miscellaneous > Show LinkedIn features in Office applications. Enabled The Show LinkedIn features in Office applications setting in Office 2016 Options is enabled. Users in your organization can use LinkedIn features in their Office 2016 applications. Disabled The Show LinkedIn features in Office applications setting in Office 2016 Options is disabled and end users can't change this setting. Users in your organization can't use LinkedIn features in their Office 2016 applications. This group policy affects only Office 2016 apps for a local computer. If users disable LinkedIn in their Office 2016 apps, they can still see LinkedIn features in Office 365.